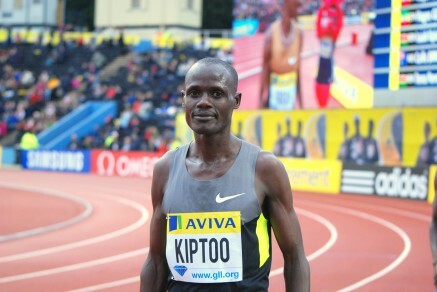 26th October 2014 – 2013 runner-up Mark Kiptoo (KEN) returned to win the 2014 Frankfurt Marathon from training partner Mike Kigen (KEN) who placed a close 2nd. In good marathon running conditions 38 year old Kiptoo proved age is just a number as he crossed the line in 2:06.49 with Kigen 10 seconds behind in a personal best 2:06.59. For much of the race the lead group contained a large group of 12 Kenyan and Ethiopian runners as they passed halfway in 62:32. The pace slowed in the second half but as they approached the 2 hours mark it was Kigen who injected a surge that split up the group. Kigen lead through 40km and the race looked to be between him and Gibert Yegon with Kiptoo two seconds down battling for 3rd. With 1km remaining Kiptoo came back on to the leaders shoulders and a few mins later, as Yegon dropped back, the race was between the PACE duo. Kiptoo, who only lost out in the final sprint last year, used his experience to surge ahead and come home a convincing winner. For Kigen it was his best marathon performance so far in his career. In his previous three marathons he ran at 2:04/05 pace for the first 30-35km but always struggled at the end. Today in Frankfurt he learned to be patient and was rewarded with a PB and podium finish.